- Ewelina and Lene make a test drive with the Defender under offroad conditions. 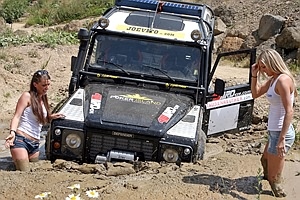 - They are looking for a real challenge for the car and drive through different mud holes. - Unfortunately is one mud hole very deep and the Defender get stuck there. Bad Luck! - Now Ewelina and Lene try to gte the car out again with the aid of the winch.